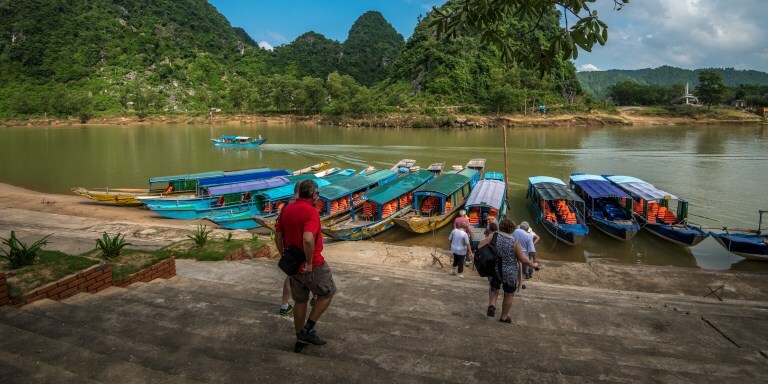 Blue boats transporting tourists going to Phong Nha, Viet Nam. The wharf was funded by ADB’s Greater Mekong Subregion Sustainable Tourism Development Project, giving local people more work opportunities. Photo Credit: ADB. Twenty-five years after the groundbreaking Earth Summit in Rio de Janeiro, leaders from around the world are increasingly embracing a vision for development that simultaneously promotes economic growth and environmental sustainability. This vision, dubbed "green growth", acknowledges the critical role of the private sector and the importance of promoting "green business." On 22 to 24 November 2016, the Asian Development Bank (ADB) held the first ever Green Business Forum (GBF). The landmark event affirmed that green business development is crucial for achieving green growth, not only because of the large environmental footprint of production activities, but also because of the much-needed resources, knowledge, and capacity that the private sector can contribute. Speaking at the GBF, Daniele Ponzi, Chief of ADB’s Environment Thematic Group, explained that by promoting new green businesses, countries around the region can unlock greater private sector investment in environmentally-sound practices and technologies. In so doing, they can help advance the 2030 global agenda for sustainable development as recently articulated through the Sustainable Development Goals (SDGs). Ponzi put it succinctly. "The main message is that, while the public sector has an important role to play in achieving the SDGs, its financing is not sufficient. To fill this gap, we need a much greater flow of investment from the private sector, and we need more green business." At the GBF, Ponzi offered a broad definition of green business as "any profit-oriented activity that supports environmentally sustainable growth." He also explained that, under this broad definition, there are two main categories of green business. The first are firms that produce environmental goods and services, which can include can include clean energy, sustainable transport, natural resources management, ecosystem services, biodiversity, and pollution prevention and control. The second are firms that green their businesses by changing their products and/or processes to take the environmental sustainability agenda into account. There is significant overlap between these two categories, as most firms in the first category also fall in the second category. The exception are those firms that produce "green" technologies that, from a life-cycle perspective, are actually resource intensive and polluting. This has been the case with solar cells, which can be quite environmentally-damaging during the extraction and production phases. Green businesses vary from large corporations to small and medium sized enterprises (SMEs). The latter dominate the corporate landscape in developing Asian countries, and also account for a sizable amount of industrial pollution and waste generation. Although each individual firm may be only polluting slightly, in aggregate, SMEs can do worse damage to the environment than larger companies. Another group of green businesses are capital providers and financial intermediaries, which are playing a more central role in green business development with the rise of green financial instruments, such as green loans, climate bonds, and impact investments. Such actors are becoming more diverse, with the increased recognition that ecological services, such as clean air and water, have economic value and can be monetized. High and upper-middle income countries, both worldwide and in the Asia Pacific region, are leading the way in supporting green business development, while a number of lower- income countries are also taking positive steps. A number of drivers are accelerating green business development (see Figure 1). The first factor is the market. Companies can go for product differentiation and subsequently gain access to new markets. The second is the business itself. Companies increasingly see opportunities to invest in process, efficiency improvements, cost reduction, and product quality improvements. The third is the financial sector. Instead of serving as a barrier to green business, which was the case in the past, finance is now becoming a key driver of green business, with green financing becoming more common. The fourth and final factor is the government. Companies are improving their environmental performance in response to effective policies and regulations. Source: Donor Committee for Enterprise Development (DCED) 2014, Final Report — Green Growth and Private Sector Development Stocktaking of DCED Experiences. Advancements in the government and financial sectors in particular reflect progress on the global stage. For instance, international agreements for protecting and managing the global environmental commons can drive changes in national-level policies. Notable examples of such agreements include the Conventions on Transboundary of Air Pollution (1979) and Biological Diversity (1992), Montreal Protocol on Ozone Protection (1985), and the Paris Agreement under the UN Framework Convention on Climate Change (2015). In addition, the 2030 Agenda for Sustainable Development has helped galvanize action around 17 global sustainable development goals (SDGs) with 169 targets between them. These include a number of environmentally-related goals, including clean water and sanitation, affordable and clean energy, sustainable cities and communities, responsible consumption and production, climate change, life below water, and life on land. . In the financial sector, the UN Addis Ababa Action Plan (2015) underscores the importance of aligning private investment with sustainable development, along with public policies and regulatory frameworks to set the right incentives. In addition, the Equator Principles, an environmental and social risk management framework for the banking sector, now cover over 70% of international project finance in emerging markets. How can companies become green? A business becomes greener when it "changes part(s) of its business model and thereby both captures economic value and reduces the ecological footprint from a life-cycle perspective. Such innovation need not be perceived as a one-time change. Instead, it should be thought of as a continuous process of efficiency enhancement and productivity improvement. Firms can integrate greenness into their business in different capacities and to differing degrees. Some are using greener inputs or selling more environmentally-sustainable products and services, while others are transforming production and consumption patterns across entire value chains. As shown in Figure 2, companies can take actions at each of the five steps in a business’ life cycle: inputs, process, outputs, environment externalities and marketing. Source: Adapted from: B. Titley. 2008. Comparative Advantage and Green Business. Ernst & Young: London. What are green goods and services? Green goods and services include technologies, products, and services that reduce environmental risk and minimize pollution and resource degradation. They are found in a multitude of sectors. At the core, there is the traditional and long-established market for environmental goods and services, which are usually associated with infrastructure and machinery, so-called “manufactured capital.” Sectors include: air pollution control; water pollution control and wastewater treatment; waste management; monitoring instruments, information, and electronic equipment; environmental consulting; and renewable energy and energy efficiency. There are also a number of other green business sectors that are associated with “natural capital”, which can also generate wealth and is just as important to emerging economies as manufactured and human capital. Examples include sustainable agriculture, fisheries, forestry, and eco-tourism. A number of these markets are supported by certification schemes, such as the Forest Stewardship Council, the Roundtable on Sustainable Palm Oil, and the Earth Island Institute’s Dolphin Safe Tuna Monitoring Program. How big is the global and regional market for green goods and services? Recent estimates of the size of the global market for green goods and services range from approximately $1 trillion to $5.5 trillion, depending on the methodology used and the extent of green business activity captured. The lower bound estimate, from Environmental Business International, focuses on traditional environmental sectors, taking into account 14 business sectors in three main areas: services, equipment, and resources. The higher bound estimate, from the UK Department for Business, Innovation, and Skills (UK DBIS), includes a wider range of activities through which goods and services pass, including design/development, manufacture, supply, distribution, construction, installation, maintenance, operations, research and development, consultancy, support services, and retail. This estimate thus captures areas of the green economy that are consistently over-looked and under-valued. If accurate, the UK DBIS estimate would make the global market for green goods and services (minus sectors like agriculture, forestry, and eco-tourism, which are not included) significantly larger than the global market for chemicals. In making this comparison, it is worth noting that chemicals are viewed as central to the world economy, as they convert raw materials into tens of thousands of products. While estimates of the global market vary greatly, there is agreement about the leading position of the Asia and Pacific region. According to data from the UK DBIS, Asia has the largest value of green sales in absolute terms and per unit of GDP, compared with other continents (Oceania is treated as a separate region). In general, Asia is strong in climate change mitigation technologies (CCMTs), mainly in the energy sector. By specific technology sectors, the region’s core strength is in efficient lighting, photovoltaics (PV), and energy storage, where it has both an innovation and export specialization. Within Asia, the PRC has the largest market share. This is to be expected given the dominant size of its economy, but also reflects a big push to develop green industries. Driven by ambitious targets to improve energy efficiency, the country has been making great leaps forward in a number of areas, including clean energy, alternative energy, and green buildings. This is exemplified by the fact that 27 of the 48 top green technology companies in the world are Chinese. In particular, the PRC is the leading global producer of photovoltaic modules. What are some pivotal entry points to boost green business development? To pursue green business innovation, governments can implement a mix of measures over the long-term to enable structural and behavioural change among producers and consumers. The following subsections explore three entry points that governments, along with development finance institutions (DFIs) like ADB, can consider in helping advance green business development. To pursue green business innovation, governments must design policies and regulations that are stringent enough to incentivise compliance and innovation, predictable enough to engender long-term investments, and flexible enough to adjust to changing circumstances, especially new technologies. “Command-and-control” approaches, such as technology and pollution standards. Market-based instruments (MBIs), such as green taxes, tradable permits, and payment for ecosystem services. Information-disclosure and voluntary policy tools, which devolve some of the responsibility for environmental protection to consumers, investors and the public. Furthermore, interventions must also address systemic failures, like unclear goals, lack of accountability, and poor communication and coordination between the public and private sectors. These can also hinder the flow of technology and knowledge, thereby reducing the efficiency of green business innovation efforts. It is also important to understand what types of companies that policies should target. In Asia and elsewhere, most companies that have taken on green business innovation are mainly larger companies. While there are cases of innovative small companies, policy makers still need to focus on assisting SME’s in making the necessary transformations of their business models. Green innovation policies and investments play a key role in supporting green business development. There are a range of options available to governments, and these are linked closely with the stage of market development. The early-stages of research and development poses a particular challenge for many emerging economies because the risks are high and the transaction times are long. Consequently, there is a lack of money flowing into new green technology development. In response, developing countries can look for opportunities to support incremental innovation by focusing on areas of comparative advantage. For instance, many developing countries are cost competitivene in manufacturing. They also have a large base of consumers, many of whom do not have a lot of resources to pay for costly solutions. Bangladesh offers a good example. With millions of people lacking electricity, the government did not focus on building a complex power grid. Instead, a state-owned infrastructure financing company is providing electricity throughout the country by supporting small-scale solar home systems. These systems do not provide electricity 24/7, but they offer a “good enough” solution that people can afford. While governments can deploy public funds to support green innovation, governments and development finance institutions can also support various green finance initiatives to provide the necessary long-term financial support to green businesses. Because of fiscal restraints in many countries, private finance must make up the bulk of green finance over the long-term. For example, in China it is estimated that over 85% of the country’s total green investment will need to be financed by private capital. In simple terms, green finance involves efforts to internalize environmental externalities and adjust risk perceptions in order to boost environmental friendly investments and reduce environmentally harmful ones. There are three main categories of green finance – green banking, green bonds, and green investing. Across these different asset classes, DFIs and governments can team up with central banks and institutional investors to implement measures to increase capital flows and develop innovative financial approaches. In green banking, efforts must focus on SMEs, as access to green finance is especially difficult for them. Over 90% of informal SMEs are proprietorships or partnerships and many are run by women who face additional challenges linked to gender discrimination, especially in rural areas. To provide green start-ups the long-term support that they need to grow and thrive, there are also growing opportunities for governments to join private investors and international aid providers in providing "blended finance". According to the World Economic Forum’s ReDesigning Development Finance Initiative, 'blended finance' is the "deliberate use of public funds to attract private capital towards investments delivering development impact in emerging and frontier markets." How is ADB supporting green business development? In Sri Lanka, ADB is helping develop the country’s first 100-megawatt wind park and create an environment for further wind power development through future public-private partnerships (PPPs). In PRC, ADB is helping reduce rocky desertification areas and improve livelihoods in Guizhou Province through water resources management, ecological restoration, and sustainable farming. In Myanmar, ADB approved a loan of $75 million to modernize the agriculture sector in the country’s central Dry Zone, which included a Global Environment Facility grant to improve land management and protect forest reserves. Working with the private sector, ADB approved $100 million to demonstrate climate-resilient farming systems in the PRC. Through its Private Sector Operations Department (PSOD), ADB supports the development of a vibrant private sector, covering a wide range of operations from cutting-edge infrastructure to helping local businesses gain access to credit. For commercially-viable transactions, PSOD provides direct loans, equity investments, guarantees, and technical assistance and concessional capital. Over the past eight years, PSOD has seen an increased emphasis on projects that focus on environmental sustainability. Such projects, which make up 20-30% of PSOD’s portfolio each year, include clean energy, sustainable transport, and sustainable water and urban infrastructure. In recent years, there has also been an increase in sustainable agribusiness operations. This is an important development in the direction of the new emerging green business areas that go beyond the traditional environmental good and services. In Bhutan, ADB made a $3 million equity investment in 2015, and provided a $1.5 million technical assistance grant in 2016 to Mountain Hazelnuts, a firm that is developing an inclusive and environmentally sustainable hazelnut value chain. In India and Bangladesh, ADB provided project financing support for eight PPP energy projects, including wind and solar, through intermediaries. In Bangladesh, ADB approved a loan of $20 million in 2016 to support socially and environmentally sustainable investments in the garment industry. In Thailand, ADB approved assistance for two innovative solar power projects in 2016, with loans of $47 million and $45 million to two companies that will each install 100 megawatts of solar energy capacity on the rooftops of commercial and industrial buildings. Within ADB, the Environment Thematic Group (ETG) will continue to support and scale up green business development in Asia and the Pacific. Specifically, it will help develop diagnostic studies on sustainable tourism in selected countries, including in the Greater Mekong Subregion and the Pacific. The ETG will also support sustainable agri-business development, such as investments in sustainable value chains and food security. ADB’s green bond program targets projects that promote the transition to low carbon and climate resilient growth, as set out in the ADB green bond framework. The current outstanding ADB green bonds amount to over $3 billion, with proceeds mainly used for energy efficiency and renewable energy, sustainable transports and green cities. The scope is expected to expand to other areas of green investments, such as natural resources conservation and ecosystem management. This program is in addition to ADB’s issuance of water bonds, which has exceeded $1.5 billion since 2010. With the PRC as a frontrunner and driving force, the ADB has also been working with "ASEAN+3 policy makers" to develop standards to grow a green bond market in the region. In November 2017, the "ASEAN Capital Market Forum" published the ASEAN green bond principles, which is an important step towards harmonization, quantification, and transparency. In addition, ADB approved a credit enhancement for geothermal energy in the Philippines. This supported the issuance of a certified project climate bond—a first for a single project in an emerging market. ADB remains focused on climate change as one of its strategic priorities and is on track to meet its target of investing $6 billion annually in climate change projects by 2020. ADB climate financing in 2016 reached $3.7 billion broken down into $2.7 billion for mitigation and $1 billion for adaptation. One significant milestone in 2017 was the launch of the Asia-Pacific Climate Finance Fund, a multi-donor trust fund that will support the assessment, development and provision of financial risk management products that can help unlock financing for climate investments. In addition, the Climate Change Fund, capitalized by ADB’s own net income, continues to play a pivotal role in managing climate risks in ADB investments. ADB was also able to attract climate finance to the region through external sources. In 2016, ADB was able to secure approval of $12 million from the Green Climate Fund for the Cook Islands to install energy storage systems and support private sector investment in renewable energy. The Green Climate Fund also approved a grant of $5 million to support a renewable energy program in the Pacific, which will help the Cook Islands, the Marshall Islands, the Federated States of Micronesia, Nauru, Papua New Guinea, Samoa, and Tonga move away from diesel power generation and toward solar power, hydropower, and wind energy. Supporting policy reforms and institutional capacity building. ADB support in this area focuses on integrating environment in development planning and decision making. Since 2001, ADB technical assistance for environmental management at country and regional levels has been more than $500 million. ADB supports a range of policy approaches, such as regulations, market-based instruments (MBIs), voluntary schemes, certification programs, and information disclosure. For instance, ADB supported a payment for forest ecosystem services (PFES) scheme in Viet Nam, which included capacity building of national and provincial policy makers. Given the prominence of climate change in the last two decades, there has been a notable increase in ADB technical assistance focusing on climate change actions. For instance, ADB helped strengthen Cambodia’s resilience to climate change through guidance in integrating climate change adaptation concerns into national and subnational development plans and budgets. To ensure that support like this continues, ADB recently launched the Climate Change Operational Framework 2017-2030, which provides broad direction and guidance for enhancing resilience and strengthening climate actions in ADB’s operations and business processes. ADB’s assistance also includes establishing and supporting regional networks. One example is the Asian Environmental Compliance and Enforcement Network (AECEN), which promotes improved compliance with environmental legal requirements through regional exchange of innovative policies and practices among its members. In 2017, ADB and partners also co-organized the International Forum on Sustainable Infrastructure in Ha Noi and developed principles for planning and designing ecologically sensitive and climate-resilient transport infrastructure. Bisgaard, Tannja, Kristian Henriksen, and Markus Bjerre. Green Business Model Innovation: Conceptualisation, Next Practice and Policy. Nordic Innovation. October 2012. Donor Committee on Enterprise Development. Green Growth Working Group. Green Growth and Private Sector Development: Stocktaking of DCED Experiences. November 2014. Environmental Business International. Purchased Dataset. 2015. ESCAP-ADB- UNEP. Green Growth, Resources and Resilience. Bangkok. 2012. Fankhauser, Sam, Alex Kazaglis, and Sugandha Srivastav. Green Growth Opportunities for Asia. ADB Economics Working Paper Series. No. 508. Asian Development Bank. Manila. January 2017. IFC. Closing the Credit Gap for Formal and Informal Micro, Small and Medium Enterprises. 2013. Nyshka Chandra. 3 December 2015. Guess where Asia’s fastest-growing clean tech industry is. CNBC. OECD/Eurostat. The Environmental Goods and Services Industry – Manual for Data Collection and Analysis. Paris. 1999. OECD. The Future of Eco-Innovation: The Role of Business Models in Green Transformation. Background Paper from OECD/European Commission/Nordic Innovation Joint Workshop 19-20 January 2012. UK Department for Business Innovation and Skills. Low Carbon and Environmental Goods and Services: 2001 to 2012. July 2013. OECD and World Economic Forum. ReDesigning Development Finance. A joint global project between the World Economic Forum and the OECD-DAC. Daniele Ponzi has worked for more than 30 years in the field of environment policy and management as staff and consultant for various international organizations and Italian companies, including the academe and NGOs. He joined ADB in 1995, and is currently the Chief of Environment Thematic Group. In his 18 years with ADB, Ponzi has worked in several departments and held a wide range of responsibilities covering the corporate strategic environment agenda and associated policies, and knowledge management for green growth. For the past 12 years, Jeffrey Bowyer has been contributing to environment-related publications for ADB, including on green growth, climate change, and water resource management. He has also worked on several regional programs, from environmental safeguards in Central and West Asia to climate change in the Pacific. He holds a master’s degree in urban planning from the University of North Carolina.